President Obama has added 10 new refuges in his first term. Many of these refuges and associated Conservation Areas, which have the potential to protect more than 1 million acres of vital wildlife habitat, have been forged through creative partnerships with sportsmen, conservation groups and private landowners. As a result, animals like the Florida panther and diminishing habitats like the prairie grasslands stand a fighting chance. It is now more important than ever to draw on the diverse group of refuge advocates around the country to safeguard America’s wildlife heritage1. National wildlife refuges have been underfunded since President Theodore Roosevelt created the first refuge in 1903 and Congress refused to appropriate money to manage it. Without adequate funding, habitats are not restored, invasive species are left unchecked, poaching and other illegal activities occur and our nation’s wildlife suffers1. Already underfunded and understaffed, National Wildlife Refuges are now facing even more budget cuts. And some members of Congress want to cut funding dramatically2. We have part of the solution to increase funding for the National Wildlife Refuge system! A birder, wildlife watcher, photographer and non-hunter version of the Federal Migratory Bird Hunting and Conservation Stamp (aka Federal Duck Stamp). Why a Separate Wildlife Conservation Stamp? A Federal Wildlife Conservation Stamp would provide a robust, parallel revenue stream for National Wildlife Refuges, while giving non-extractive users a funding tool and a stronger voice in habitat and wildlife decisions on our shared, public lands. These quotes summarize the challenges facing the current Duck Stamp program: reduced financial support; cultural differences between hunters and non-extractive users; and, a strong association with Duck Stamps as a traditional financial resource for hunters. These statements also indirectly point to a viable solution, which is a separate Wildlife Conservation Stamp. Not only would such a stamp help overcome revenue shortfalls in the National Wildlife Refuge System, it could erase the cultural obstacles cited by Jackson. A dedicated Wildlife Conservation Stamp would also instill a source of community pride and involvement for birders and wildlife watchers, just as the Duck Stamp does for hunters. Wildlife watchers and birders share a passionate commitment to wildlife, but they often diverge from hunters on which habitat, resources and Refuge priorities should be funded and emphasized. Among birders and wildlife watchers, there’s little disagreement about supporting our 560 National Wildlife Refuges, along with the habitat and wildlife they sustain. Most wildlife watchers are anxious to contribute their resources toward that end. Disagreements tend to occur, however, when the subject of the Federal Duck Stamp arises. Because of this accounting, hunters have disproportionate influence and use of Refuge lands during the height of fall and winter migratory bird season. In some cases, large portions of, or entire Wildlife Refuges are closed to the non-hunting public during this time. Historically, National Wildlife Refuges viewed the “Duck Factory” (game bird conservation) as a high priority, while relegating non-game issues to a lower rung. It’s only in recent years that Refuges have fully acknowledged this gap in resource allocation, but funding is still not nearly adequate to achieve all resource goals. Hunters and groups like the NRA consistently leverage the power of Duck Stamp funding to promote hunter-friendly agendas (such as expansion of hunting rights on refuges) sometimes overriding the voices of non-hunters whose wildlife considerations are often different yet equally valid. According to CARE5 (Cooperative Alliance for Refuge Enhancement) consistent underfunding cripples our National Wildlife Refuge System in a variety of ways. There is an operations and maintenance backlog of $3.3 billion. There’s also a chronic understaffing problem which leaves more than 36 percent of refuges without onsite personnel. Additional issues include a shortage of law enforcement officials, as well as invasive species problems on 2.5 million acres of Refuge lands. In a time of Congressional austerity, Refuge advocates face an uphill battle in retaining public funding for the Wildlife Refuge System. A 2011 survey by the U.S. Fish and Wildlife Service6 counted 71.1 million wildlife watchers in the U.S., and 13.7 million hunters. Wildlife watchers outnumber hunters significantly, and they spend $55 billion dollars each year in the pursuit of wildlife activities. In other words, there is a large and enthusiastic source of untapped revenue from wildlife watchers, one that could be rendered viable through the dedicated funding stream of a Wildlife Conservation Stamp. A Wildlife Conservation Stamp could fund species and habitat projects that are sometimes short-changed in favor of game animal priorities. It would be a separate but parallel and symbiotic addition to Refuge budgets. Birders, photographers and wildlife watchers, through this financial avenue, could have a voice in Refuge diversity as well as in innovative research, education and habitat programs. A Wildlife Conservation Stamp could fund additional opportunities for birders and photographers — such as new observation and photography blinds, or access to areas traditionally reserved for hunters. There are large portions of National Wildlife Refuges closed off to all but hunters. Those sections include hunting blinds and free-roam areas that non-extractive users never have access to — even after hunting season ends. The Wildlife Conservation Stamp could feature a contest for wildlife photographers who would compete for the winning image in the same way Duck Stamp artists do. The price of entry for Duck Stamp artists is $125. A similar fee could be implemented for a photography contest, further supplementing revenue for the National Wildlife Refuge System. Wildlife watchers could advocate for the Wildlife Conservation Stamp together, as a powerful unified group, without the misgivings and debates that tend to arise over the existing Duck Stamp and its traditional association with hunters and hunting interests. We urge you to download the Wildlife Conservation Stamp Proposal (in pdf format) and use it to further the cause in any way you see fit. Also feel free to use the four panel stamp image at the top of the post which can be downloaded here or by clicking on the image above. We will also be setting up a website to promote this additional income stream for our National Wildlife Refuge System. Look for it in upcoming posts. Sign the White House petition started by 10,000 Birds! We urge you to go sign the petition now! It’s quick and easy and please when you are finished, inform your twitter and facebook friends too! We need 25,000 signatures by December 14th so let’s get crackin’! I’ve long been fairly cool on this topic, Larry, but you’ve convinced me. Thank you! @Rick: Larry is pretty darn persuasive, isn’t he? You’ve sparked a terrific debate, and I’m enjoying the exchanges very much. Everyone’s intentions are good in this effort, and I applaud the attention you’re focusing on the greater cause of conservation. Great work! Before you re-invent the wheel, why not encourage the birders to purchase a federal duck stamp? They have benefited from the duck stamp dollars all these years. Plus, when the USFWS sees the increase in sales, they will be able to recognize the contribution of the birders and will be much more likely to consider expanding the stamp program. If you do get FWS to agree to a stamp program, I hope you consider following the example of the duck stamp with an art contest. It is one of the highlights of our year. I would encourage anyone who is able to attend the contest at least once! Rita, I gather you haven’t been following this discussion on 10,000 Birds but the point of recommending a new stamp is that the contributions of birders and other non-extractive wildlife watchers to the Duck Stamp program are consistently overlooked. Your art contest idea, however, is terrific! Mike, I completely understand your point. However, I suggest that if the birders want their stamp proposal to be taken seriously, first purchase the stamp that already exists. The increase in sales will surely be noticed and I think that would go a long way toward making the idea of a “birder” stamp more appealing to the federal government. Right now, the proposal is nothing more than a wing and a prayer (pun intended) and I don’t see USFWS creating a new program where one already exists. Prove that the birders support a stamp program and I think you will have a much stronger case! Rita, if the powers-that-be tracked and credited who was purchasing stamps, birders wouldn’t need a separate stamp program. Non-hunters cannot prove how many stamps we purchase (or might purchase if we counted) so your suggestion makes no sense to me. This article, while good, probably does not have the real numbers, as there are not 2 million duck stamps sold to birders each year. 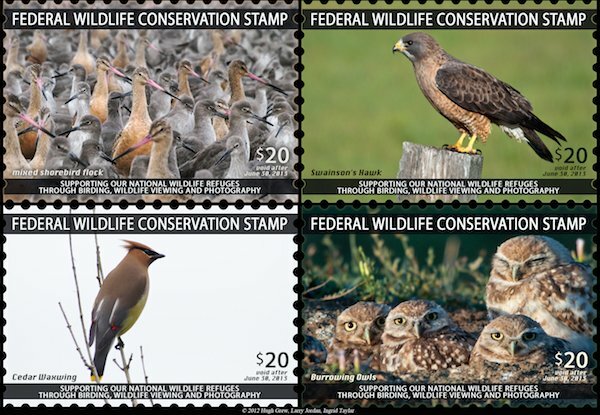 I’m just saying that if the number of stamp sales showed a huge increase over a couple of years, the Fish and Wildlife service is smart enough to figure out that the birders are pulling their weight. THAT will get their attention and make your campaign for your own stamp a lot more likely to happen. Studies show that there are 50 MILLION birders in the U.S., but only 2 million care enough to purchase a federal duck stamp. The number of duck stamps sold is known and reported. The total number of duck hunting licenses can be estimated, but not exactly determined because in most states a small game license plus a duck stamp allows you to hunt waterfowl, but not all small game licensees add the duck stamp. Still, the difference between total duck stamps sold and total duck hunters can be estimated and is the total attributable to non-hunter purchases. This would include both stamp collectors and “conservationists” who see the purchase as a contribution. From what I know about the size of the collector market, I think it is quite low in proportion to to the conservationist market. As a stamp collector, I would welcome another federal stamp. If it were priced less than the duck stamp, it might cannibalize existing duck stamp sales to conservationists, which would be offset by the amount of collector and new conservationist purchases. I imagine such a new stamp might grant access to federal wildlife areas, as does the duck stamp, in which case it might cannibalize duck stamp sales still further. These are just issues that might factor into an analysis of how much incremental revenue a new stamp might bring. As a hunter, I am dismayed by the anti-hunter prejudice I read in most of the comments. Hunters are conservationists also, and not just because of the money we spend. Uncontrolled growth in waterfowl flocks has be proven to lead to overpopulation of nesting areas and increases in avian diseases. Most birders don’t hunt – I get it. But if I and my fellow hunters didn’t hunt, there would be fewer healthy birds, not more. It was also commented that during waterfowl hunting periods, many parts of federal wildlife areas are closed to birders. I would like to point out that you don’t have to hunt to get into those areas; you just need a license and a duck stamp. Any monies spent to buy a license that will not be used for hunting is more money to the state wildlife agency to use for conservation. On top of that, I ‘willingly’ & ‘enthuastically’ pay a whopping amount each & every year for my sportsman’s hunting/fishing license and stamps. I am also an avid birder, and spend many hours in the blinds without firearm. Armed with camera and sketch pad. Over and above what I willingly donate thru my work, I also volunteer in clearing wetlands, building blinds, banding birds etc. I firmly believe ‘All’ who enjoy our natural wonders should dig into they’re own pockets and equal what sportsmen do. Does any one remember what the first Duck stamp cost? My , my how the times have changed over the last 55 years. The last time I checked, a federal Duck Stamp cost $15 . if you don’t get it at the post office, there is also a service fee attached too, not to mention–There has been some debate of another price increase for years now. So, in all likely hood –It will be an ongoing issue as we movwe forward. And it should be. Especially, if no one else but hunters and collectors wishes to take on the burden of protecting and exspanding OUR refuges. The Fed Duck hunting stamp is in fact a conservation stamp. News flash! it always has been from day one and wil continue to do that job.–What does it get you these days besides some hunting oppertunities and a nice piece of history for youe stamp collection? Well, It does give you ammittance to most NWRs annually. Untill recently, The wildlife drive and many other public acceses points at MINWR in Florida have always been free of charge, WHY? Mostly, because the funding from Duck stamps was enough to keep up the maintanance and a staff to make imporovemants. But, unfortunately, over the years the money has begun to fall short and many areas of this rufuge had to be closed for safety and/or poor habitat . Now, Merrit Island also has a user fee. Ooops, now the birders and fishermen are paying a share here too! As well they shoud. Still–They could be buying a Duck stamp and go all year long, but I think it is safe to assume that most would rather NOT. I don’t think having birding conservation stamp will change that unless it is one that’s good for liife and peolp thimk that they can save some money over time. Does anyone out there feel willing to pay Say $100+. for a Lifetime conservation stamp if it would always replace the current fees even when they start going up? As An wildlife artist and hunter I would consider it, But if you think that having another stamp for those that are too selfish to help support the current program as it is, the program that has funded the purchase of over 50% of all the land in OUR NWR system, then I think your going to find out you’ll have to make it very cheap to keep up the sales and this will probally not do enough to solve the problem of OUR diminishing funds for the NWR system. GOOD Luck with that! I do like the fact that you’re trying to help raise awareness and hope and pray that you can succeed on making more money for our refuges. In the mean time ….. I suggest you invest in our refuges now! Before it’s too late, Lkie the rest of us who always buy one or more stamps every year. Hey – why exclude wildlife artists! The federal duck stamp contest is a very limited venue for most wildlife artists. Why not alternate stamp years between photography and artwork? I believe the Birders Stamp has a valid future. But if we want the birders to buy the Birders Stamp, the price should be the same as the Duck Stamp. Not higher or lower, but the same. Then each population will buy their appropriate stamp and no one will be buying the other group’s stamp in order to save $5. This will give the FWS accurate data on who the purchasers are and their importance in the economics of wildlife refuge management. And any future price changes should move in tandem at all times. I just tired to sign the petition and find that it has expired. Is this not a current petition? Does it need to be restarted? Rita, you have to go back to the late 1970s to find a year where TOTAL duck stamp sales were two million. I think the article you linked is referring to total duck stamp sales and is still a significant overstatement as to how many stamps are sold. Do “Birders” realize if it wasn’t for wildlife conservation Dollars they would be left with no place to come and photograph or view the birds they love. I have personally raised 30 million dollars for wildlife conservation. I read the report that Birders spend so much more than the hunting public. They may spend more money on travel and hotels..that is a stretch, but they do not donate to the conservation effort. I have painted over 65 stamp prints and I can tell you, my conservation effort far surpasses Billy Ray the bird watcher!. He gets in his car and drives to site A, provided by the federal Government, at NO charge and watches bird. Spend REAL money for the Birds you love!! I Pay for your enjoyment, time you stepped up! I know you hate hunting, but we do not hunt Red Wing Black birds, or Eagles, or Coopers Hawks. STEP UP! my 12 stamps/prints have raised far less than what you’ve accomplished. It’s still put a good amount of $ towards the cause. Does any one remember what the first Duck stamp cost? It was well before my time. My, my how the times have changed over the years. The last time I checked, a Federal Duck Stamp cost $15 . And, if you don’t get it at the post office, there is also a service fee attached too, not to mention–There has been some debate of another price increase for years now. So, in all likely hood –It will be an ongoing issue as we move forward. And it should be. Especially, if no one else but hunters and collectors wishes to take on the burden of protecting and expanding OUR refuges. The Fed Duck hunting stamp is in fact a conservation stamp. News flash! it always has been from day one and will continue to do that job.–What does it get you these days besides some hunting opportunities and a nice piece of history for your stamp collection? Well, It does give you admittance to most NWRs annually. Until recently, The wildlife drive and many other public acceses points at MINWR in Florida have always been free of charge, WHY? Mostly, because the funding from Duck stamps was enough to keep up the maintanance and a staff to make imporovemants. But, unfortunately, over the years the money has begun to fall short and many areas of this rufuge had to be closed for safety and/or poor habitat . Now, Merrit Island also has a user fee. Ooops, now the birders and fishermen are paying a share here too! As well they shoud. I do like the fact that you’re trying to help raise awareness and hope and pray that you can succeed on making more money for our refuges. In the mean time ….. I suggest people who have not done so, who really care go ahead and invest in our refuges now! Before it’s too late, Like the rest of us who always buy one or more Federal Duck stamps each and every year. It’s a mistaken notion to say that birders, photographers and other non-consumptive users don’t contribute to conservation or wildlife. We contribute to land trusts, wildlife conservation organizations, birding organizations like Audubon … we roll up our sleeves for habitat restoration projects and wildlife rehabilitation causes, tallying hours of volunteer work that’s never enumerated. The only reason people can make these claims like the ones above — about us not paying our fair share — is because the revenue isn’t consolidated into one fund, as it is, for instance, with Pittman-Robertson. Even the fees generated through P-R are supported, in bulk, by gun owners, the majority of whom are not hunters but who pay tax on ammo. Furthermore, non-hunters purchase the Duck Stamp but to date, there is no accurate accounting for how many stamps that is. Just buy one online or at the Post Office and see if anyone asks you whether you are a hunter or a birder. Lastly, although hunters do, indeed, contribute to various efforts, the Duck Stamp funds account for about 3 percent of land acquisitions for refuges. A significant portion of funding comes from public monies. I am new to birding. I have been in my local NWR 3 or 4 times this year. I found out about the duck stamp, and bought it for $15. I have been paying the daily fee for NWR’s, parks, etc. for years which adds up to more than a $15 Duck Stamp. I bought my stamp at the nature center, and asked about a birding stamp. They said this was something they really wanted to do, but didn’t have one yet. Many of my birding friends have the Duck Stamp. It is and was a great idea, but you can see from these responses that many sportsmen do not realize that birders are already contributing to this program. Why not promote the wildlife stamp and get the real numbers. Of course, I like the actual duck stamp, and hope maybe they would give us a choice between a yearly bird and some other type of wildlife!